Whenever I debate my left-wing friends on tax policy, they routinely assert that taxes don’t matter. They argue that we don’t have to worry about the Laffer Curve because high tax rates don’t discourage taxable income. They argue that we don’t have to worry about double taxation because high tax rates don’t discourage saving and investment. They argue that we don’t need fundamental tax reform because tax burdens don’t have much impact on economic performance. They argue that we don’t have to worry about punitive marginal tax rates because such policies don’t discourage work. It’s unclear, though, whether they really believe their own rhetoric. After all, if taxes don’t affect economic behavior, then why are folks on the left so terrified of tax havens? Why are they so opposed to tax competition? And why are they so anxious to defend loopholes such as the deduction for state and local taxes. Perhaps most revealing, why do leftists sometimes cut taxes when they hold power? A story in the Wall Street Journal notes that there’s been a little-noticed wave of state tax cuts. Specifically reductions and/or eliminations of state death taxes. And many of these supply-side reforms are happening in left-wing states! 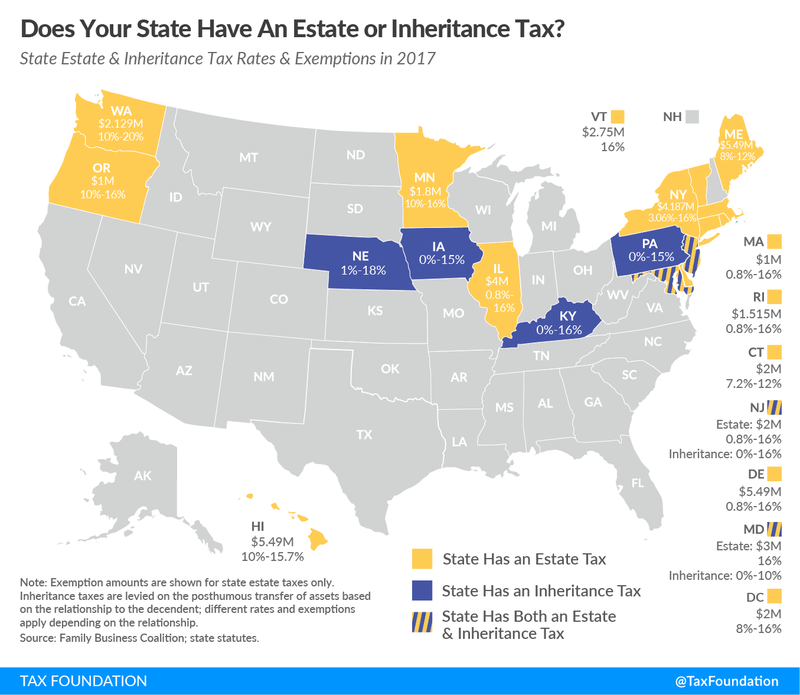 In the past three years, nine states have eliminated or lowered their estate taxes, mostly by raising exemptions. And more reductions are coming. Minnesota lawmakers recently raised the state’s estate-tax exemption to $2.1 million retroactive to January, and the exemption will rise to $2.4 million next year. Maryland will raise its $3 million exemption to $4 million next year. New Jersey’s exemption, which used to rank last at $675,000 a person, rose to $2 million a person this year. Next year, New Jersey is scheduled to eliminate its estate tax altogether, joining about a half-dozen others that have ended their estate taxes over the past decade. This is good news for affected taxpayers, but it’s also good news for the economy. Death taxes are not only a punitive tax on capital, but they also discourage investors, entrepreneurs, and other high-income people from earning income once they have accumulated a certain level of savings. But let’s focus on politics rather than economics. Why are governors and state legislators finally doing something sensible? Why are they lowering tax burdens on “rich” taxpayers instead of playing their usual game of class warfare? I’d like to claim that they’re reading Cato Institute research, or perhaps studies from other market-oriented organizations and scholars. But it appears that tax competition deserves most of the credit. This tax-cutting trend has been fueled by competition between the states for affluent and wealthy taxpayers. Such residents owe income taxes every year, but some are willing to move out of state to avoid death duties that come only once. Since the federal estate-and-gift tax exemption jumped to $5 million in 2011, adjusted for inflation, state death duties have stood out. I don’t fully agree with the above excerpt because there’s plenty of evidence that income taxes cause migration from high-tax states to zero-income-tax states. But I agree that a state death tax can have a very large impact, particularly once a successful person has retired and has more flexibility. Courtesy of the Tax Foundation, here are the states that still impose this destructive levy. Though this map may soon have one less yellow state. As reported by the WSJ, politicians in the Bay State may be waking up. In Massachusetts, some lawmakers are worried about losing residents to other states because of its estate tax, which brought in $400 million last year. They hope to raise the exemption to half the federal level and perhaps exclude the value of a residence as well. These measures stand a good chance of passage even as lawmakers are considering raising income taxes on millionaires, says Kenneth Brier, an estate lawyer with Brier & Ganz LLP in Needham, Mass., who tracks the issue for the Massachusetts Bar Association. State officials “are worried about a silent leak of people down to Florida, or even New Hampshire,” he adds. I’m not sure the leak has been silent. There’s lots of data on the migration of productive people to lower-tax states. But what matters is that tax competition is forcing the state legislature (which is overwhelmingly Democrat) to do the right thing, even though their normal instincts would be to squeeze upper-income taxpayers for more money. As I’ve repeatedly written, tax competition also has a liberalizing impact on national tax policy. Following the Reagan tax cuts and Thatcher tax cuts, politicians all over the world felt pressure to lower their tax rates on personal income. The same thing has happened with corporate tax rates, though Ireland deserves most of the credit for getting that process started. I’ll close by recycling my video on tax competition. It focuses primarily on fiscal rivalry between nations, but the lessons equally apply to states. P.S. For what it’s worth, South Dakota arguably is the state with the best tax policy. It’s more difficult to identify the state with the worst policy, though New Jersey, Illinois, New York, California, and Connecticut can all make a strong claim to be at the bottom. P.P.S. Notwithstanding my snarky title, I don’t particularly care whether there are tax cuts for rich people. But I care a lot about not having tax policies that penalize the behaviors (work, saving, investment, and entrepreneurship) that produce income, jobs, and opportunity for poor and middle-income people. And if that means reforms that allow upper-income people to keep more of their money, I’m okay with that since I’m not an envious person.